Triple coverage? Megatron don't care. Every Tuesday during football season, editors Jeremy and Joe will bring you the good, the bad and the ugly from the college and pro football weekend that was. Good might be an understatement after Calvin Johnson snatched 14 balls for 329 yards against Dallas, the second-highest single game receiving total in NFL history. Only historical footnote Flipper Anderson of the LA Rams has ever had more, and Megatron seemed to make his most impressive plays in the biggest moments. The biggest, of course, being the Johnson's 22-yard catch on a sensational throw from Matthew Stafford that set the Lions up with first and goal at the Cowboy one-yard line. 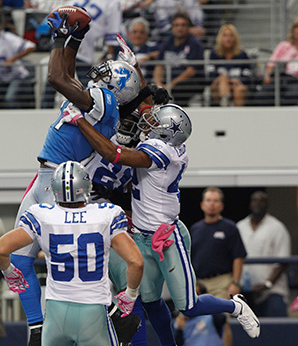 Seconds later, Stafford jumped over the pile to complete the 10-point Lions comeback. Some scary thing to consider about Megatron's day, which I would consider the greatest receiving game in NFL history. -He only had one touchdown. Twice he was stopped at the one-yard line. -He did it all in regulation against a defense built to defend the pass. Flipper Anderson's 336-yard record setting performance came in overtime when Jim Everett and the Rams were one of the few teams in the league airing it out. -Half his reception went for 20 yards or more. That's absurd. -His 14 caches came on 16 targets. Also absurd, considering the Lions were playing from behind, and you knew who they wanted to get the ball to. -Oh yeah, and he may not be fully healed from a leg injury that's nagged him the majority of the year. “Just wait until he’s 100 percent,” Detroit coach Jim Schwartz said. Let's be honest, there isn't much to love about the St. Louis Rams. They have a quarterback with an ACL tear and an albatross contract (never a good combination), a jarring lack of talent at the skill positions (despite spending seven picks in the last two drafts on running backs and wide receivers), and a general malaise surrounding the team. But man, that defensive front. Robert Quinn has 10 sacks through eight games, and Chris Long has added 5.5 of his own. They can't stop the run to save their lives (one of the five worst rushing defenses by seemingly any metric), but they can get after the quarterback. God forbid they ever have an offense that can score points, because if they have the lead and the opponent is forced to throw, the game is basically over. The Ducks pretty much told UCLA to watch the throne Saturday night, blowing the Bruins out 42-14 to jump to No.2 in the BCS and set up an epic clash with new BCS No. 5 Stanford on Nov. 7th, after both teams' bye week. The Ducks will look for vengeance after the Cardinal knocked them off last year, and Oregon quarterback Marcus Mariota is a legit Heisman candidate. Still, it may be Oregon's much improved defense that could land them in the BCS championship game. The one unfortunate thing is that the new College Football Playoff isn't beginning this year. How great would it be to see Alabama face Ohio State and Oregon face Florida State in a pair of national semifinals? This would have been an ideal year for the playoff to start. Don't look now, but the Panthers have the fourth-best average margin of victory in the NFL. The Panthers have outscored their opponents by 74 points over seven games, a +10.6 average, better than Seattle's +10.0, San Francisco's +9.1, Indianapolis' +8.0, and Green Bay's +7.7. Yes, they have played an easy schedule, and yes, their blowout wins have come against some of the worst teams in the league (New York Giants, Minnesota, Tampa Bay), but statistically speaking, a 30-point win over a bad team is just as reliable in terms of correlating to future success as a 7-point win over a good team. Carolina lost their first two games of the season in large part because their coach was too conservative as a 4th-down play-caller, opting for punts and field goal attempts instead of trying to put the game away with a conversion. Now that he's altered his philosophy, Carolina has won three straight. Their schedule turns in the second half of the season, featuring two games against division rival New Orleans, plus a visit to San Francisco and a home game against New England on a Monday night. But if the Panthers can turn their blowout wins against bad teams into competitive games against good teams, they could sneak into the the last Wild Card spot in the NFC. Nick Saban is an evil football genius. We all know this. But now he's just coming off as a little petty, after suspending the block seating privileges of 20 student organizations Friday. Why did he take away those student's seating privileges? Because they apparently have been leaving Alabama's boringly efficient blowout wins early this year. I'll let the Nicktator take it from here. "My sense of it is, I always say the fans are a part of the team," Saban said, according to the Anniston Star. "Everybody else should have the same sort of commitment. You don't have to do the work all week, you don't have to practice, you don't have to come in at 7 in the morning and leave at 11 at night, you don't have to do any of that stuff." Well Nick, I hate to tell you, but fans aren't a part of the team (As athletes and coaches constantly remind them). So, unless you want to put those kids on scholarship and give them free tickets, I think it's a little out of bounds to say you deserve their commitment. It's college. Kids are there to get drunk and have a good time. Football is the best way to do that in Alabama, but let's not pretend they're there to do a job. They pay to be entertained. If you aren't entertaining them, even if it's because you're too good, they have the right to leave. Well, they let Terrelle Pryor go for a quarterback record 93-yard touchdown run on the first play from scrimmage, and things didn't get much better after that. A Herculean effort from QB Ben Roethlisberger made the game close late, but Pittsburgh's start was laughably bad. It's one of those parts of football that is so fundamental that it's incredulous how bad they are. They can't run in a straight line and pick up three yards, even by accident? The Ravens are averaging 2.8 yards per rush (dead last), and have run the ball 185 times in seven games, which is right around league average. The combination of the two amounts to the Ravens rush offense producing an expected -48.72 points through seven games. That's exactly as bad as it sounds. The ineptitude with which they run, and the frequency with which they display that ineptitude, has cost Baltimore nearly seven touchdowns through seven games. If we were to award Baltimore one touchdown in each of their games this season, they would be 6-1, not 3-4 - their losses to Buffalo (23-20), Green Bay (19-17), and Pittsburgh (19-16) would turn into wins. Dez Bryant is really good. Heck, he might be the second-best receiver in the league. But, he ain't no Megatron, no matter what he says. So, after Calvin Johnson went bananas on the Cowboys in Detroit's comeback win, and Bryant was seen yelling at Jason Witten and other teammates on the sidelines, it left a pretty sour taste in Dallas fans' collective mouth. On the field, Bryant made a huge 50-yard TD grab (And another 5-yarder), but disappeared far too often in the second half to put the blame on anybody else afterward. As much as I love the Cowboys' potential this year (I've never bought into their hype before, but this year I love that offense), Bryant is going to have to step his game up another notch for Dallas to be anything more than an average team.